WordPress is one of the best open-source content management system (CMS) based on PHP and MYSQL, it is the most popular blogging system used by more than 23% of the top 10 million websites. WordPress is installed on more than 60 million websites. There are plenty of ready to use themes and plugins available for WordPress. You can use WordPress as your blogging platform, as e-commerce site (with WooCommerce) or as CMS system for your company website. The first WordPress version has been released on May 27, 2003, by Matt Mullenweg and Mike Little under GPLv2 license. WP-CLI is set of command line tools to provide a command line interface to manage your WordPress site. From zero to Hero, you can use it to create your WordPress site, manage the WP database, alter the site description, install and manage themes and plugins etc. This is very cool stuff that can save you a lot of time. You can update plugins, setup multisite installations and much more without having to log in to WordPress in a web browser, you can do it all from the shell terminal/SSH. I’ll use Ubuntu 15.10 here, but the same steps should be compatible with Debian 8 as well. What is covered in this tutorial? 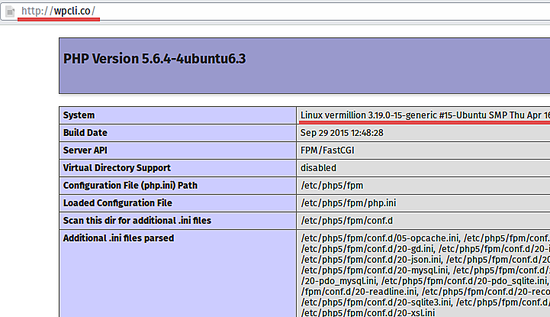 Installation and configuration of a basic LEMP (Linux, Nginx, MySQL, PHP) server. 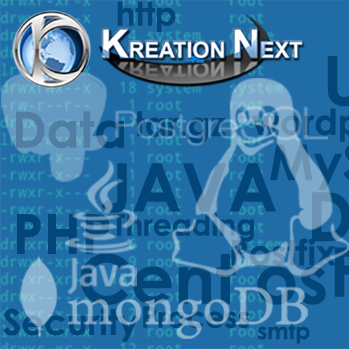 In this tutorial, I will use Nginx as web server, MySQL as the database system and PHP-FPM to run WordPress. Nginx is one of the fastest web servers, it provides a high performance with low memory usage. Now edit the php.ini file in the directory “/etc/php5/fpm/”. Now configure Nginx to use PHP-FPM, please go to the directory “/etc/nginx/sites-available/” and create a new file for the virtual host configuration. 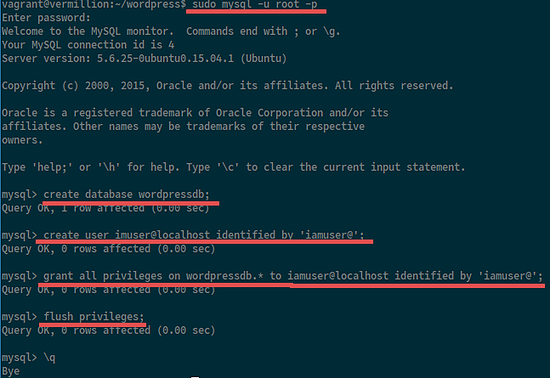 Replace “wpcli.co” in the server_name setting with the domain name that your WordPress installation shall use. 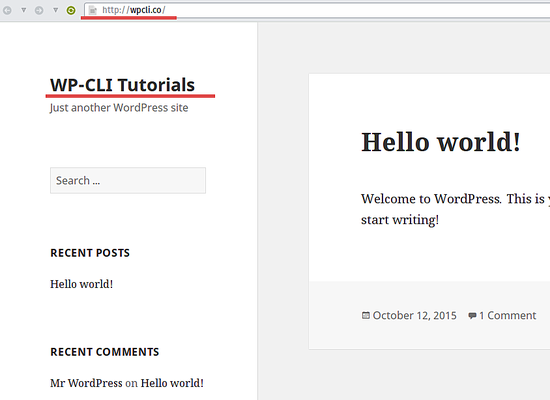 Test the PHP and Nginx installation by visiting the site “http://wpcli.co/” in a browser. Replace wpcli.co with the domain name of your website / server. 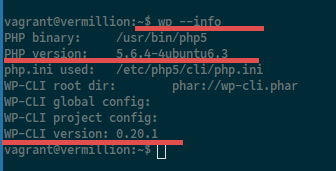 You can see here that I’m using PHP 5.6 and WP-CLI 0.20. A running LEMP (Nginx, MySQL and PHP) installation. A VirtualHost with domain wpcli.co (or the domain name that you have chosen for your site). A Web Directory in “/home/vagrant/wordpress/”. 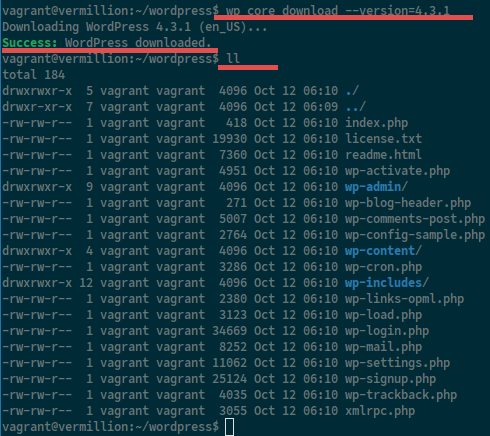 Now we will install WordPress with the domain “wpcli.co” in the directory “/home/vagrant/wordpress/“. We will do this with WP-CLI. If you want to use a different version, just change the version number. I’ve created a new database with the name “wordpressdb”, a new user “iamuser”, and I’ve granted access for the user to the database. The database has been created, now I’ll create a “wp-config.php” file with the database credentials of the MySQL user that we added above. When you see this line, then the file has been created successfully. 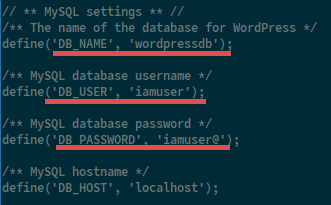 Now if you “cat” the wp-config.php file, you will see the database configuration there. –title: Title of your site. –admin_user: Admin username that you use to login to the WordPress. –admin_email: Your email address to get noticed for any site-related issue. Now visit your domain name: wpcli.co with the web browser again. (If you want to test the admin, please go to wpcli.co/wp-login.php instead). WP-CLI has many more commands and options, you can use “wp –help” to see all commands. There are commands to manage WordPress users, user roles, posts, the menu, widgets etc. WordPress is a popular CMS and blogging platform used on millions of websites. There are many free and commercial WordPress plugins and themes available. WP-CLI is set of commands to manage your WordPress site, it is very useful and easy to use. You can build and manage your WordPress site directly on the shell without having to log into WordPress in the browser. Has Paid Search Become The New NYC Mailbox?